Looking for the best pressure cooker cookbook? We’ve got the top 10 best selling cookbooks on Amazon.com right now! We try to keep this list as up to date as possible…..if you have a suggestion, please contact us! Cookbooks first stemmed from a collection of recipes for complicated food – as in that time, simple dishes were ignored, or dismissed. The first recipe compilation was called ‘De re coquinaria’ and was written in Latin in the 1st Century; although recipe books from different parts of the world have been recovered from different time frames e.g. ‘Daz buch von guter spise’ circa 1350 and al-Warraq, in the early 10th Century. From that time period to now, a lot has changed about cookbooks, they’ve evolved and adapted along with the rest of the world and so, not only do they reflect the introduction and almost melding of different cultures, but also the new and innovative methods that we use to cook our everyday food. One method of which is Pressure Cooking, the method of cooking food under high pressure to retain moisture, nutrients, vitamins, flavours; and make use of economic cuts of meat. I’ve found Pressure Cooking Properly Explained by Dianne Page to be especially helpful, not only does it have recipes for soups, meat, poultry, vegetables, preserves, fish and meals specifically for one person; but the author also clearly lays out the advantages to pressure cooking, how to choose a good one (although I hope we’ve done a good job on this website), how to use the pressure cooker, adapting recipes and, especially important, how to take care of your pressure cooker so that it stays in tip top condition. In paperback format, it costs less than $6 and is great if you’re watching a budget. Click here to view Pressure Cooking Properly Explained on Amazon.com.. Although Great Food Fast by Bob Warden, does indeed have a lot of useful tips, great recipes and nutritional information, and it is straying from the traditional format, I really would have liked to have seen a Table Of Contents or something similar to give the book some structure, instead I find myself stumbling around blindly wondering how you can go from Tortellini and Meatball Soup to Five Alarm Chilli, then back to Broccoli and Cheese Soup. I know it’s kind of a petty thing to call this book out on, especially with all the great information provided, shopping lists and all the rest, but personally it’s something I find very hard to overlook. ‘Great Food Fast’ costs a little under $15 as a paperback. From the owner of hippressurecooking, Laura Pazzaglia, a new pressure cooker cookbook has been conceived and carefully crafted. Hip Pressure Cooking: Fast, Fresh and Flavourful not only sums up why people like pressure cooking in the title, but also very helpfully splits the recipes into very clear-cut categories – soups and stocks, eggs, vegetables, dried beans and legumes, pasta and sauces, grains, meat and poultry, fish and seafood, one-pot meals, desserts and preserves and juicing. For a hardcover copy, Hip Pressure Cooking: Fast, Fresh, and Flavourful costs a little under $20. #7 – Blue Jean Chef: Comfortable Under Pressure! Meredith Laurence offers up 125 recipes and takes care to offer more than 100 explanations and tips in her brilliant book Blue Jean Chef: Comfortable Under Pressure!, yet despite the title fails to give the level of reassurance that first time pressure cooker users need. Although just under $20, the sheer amount of tips and tasty mouth-watering recipes will make your purchase worth it. Diane Phillips’ The Easy Pressure Cooker Cookbook is a must-have for any first time pressure cooker user with a family that includes young children. I don’t know many cookbooks that adapt themselves to a baby’s needs but this one does, and superbly too, provided that you don’t have an electric pressure cooker and can lessen the amount of liquid in the chilli recipes; but for just over $18, The Easy Pressure Cooker Cookbook is still a bargain. At little over $16, the Miss Vickie’s Real Food Real Fast Pressure Cooker cookbook written by Vickie Smith is ideal for anyone with a pressure cooker that goes on the hob and wants nothing more than to create simple, delicious meals using ingredients commonly found in their pantry, and with dishes such as Almond Orange Poppy Seed Cake and Meat Broth, Miss Smith shows that it’s possible to perfectly balance ingredients on a budget and still have good quality, healthy and filling food. Some of the recipes in this book are quite advanced, but I find a challenge is always healthy for the stay-at-home Moms and Dads who love to cook up delicious food! 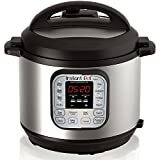 Click here to look at Real Food Real Fast Pressure Cooker on Amazon.com.. In contrast to some of the other pressure cooker cookbooks discussed thus far The Everything Pressure Cooker Cookbook is written specifically for use with an electric pressure cooker but still allows you to experience some great food. For just slightly more than $10, Pamela Rice Hahn has compiled the perfect recipes that can be used for any and all situations, if you’re trying to impress then try the Halibut in Black Olive Sauce, or if you’re celebrating something in a little more of a familial environment then why don’t your test your hand at whipping up a Peanut Butter and Fudge Cheesecake? Cooking Under Pressure (written by Lorna J Sass and typically sold at just under $16) is the perfect way for beginners to experience the joys of pressure cooking while having a range of simple to more challenging recipes allowing you to improve your cooking skills and gradually feel more comfortable with your pressure cooker. Helpfully opening with tips and tricks to make your pressure cooker tick, and troubleshooting at the end of the book, Cooking Under Pressure is the needed confidence boost allowing you to get to grips with your new pressure cooker with little to no effort at all. Her vegetarian alternative Great Vegetarian Cooking Under Pressure is also worth looking at. Click here to learn more about Cooking Under Pressure on Amazon.com.. Renowned for controversial responses, I’m one of the people who actually like America’s Test Kitchen and I think that Pressure Cooker Perfection (just over $13) gives a brilliant range of recipes that fully use the pressure cooker’s full potential, the introduction about why you should pressure cook is a bit useless if you’ve already got one though. Vickie Smith has done it again AND she’s even managed to cater for owners of both electric and stove-top pressure cookers, what more could you ask for? With an index that spans 11 pages Miss Vickie’s Big Book of Pressure Cooker Recipes will have you trying new and familiar recipes that you love time after time – and for just a little more than $15! I once met a business owner who solely relied on this book to cook new dishes for customers. They would explore a different recipe each day, and put them to trial in way of the eaters voting. They soon created several signature dishes – all based on this book! Click here to look at Miss Vickie’s Big Book of Pressure Cooker Recipes on Amazon.com.. So why don’t you go over and take a look at those cookbooks right now, I’m sure you’ll find the one for you! Don’t have a pressure cooker yet? Check out our pressure cooker reviews today! Just wondering if you ever used Bob Warden’s Slow Food Fast book? It was his original book and I was wondering how it compares to Great Food Fast? Observing his foods on TV, I like the looks of the original one better, but wondered which to get by someone who has actually read them both.. thanks! I have not, but I will check it out – thanks! Pressure cookers are like crock pots on steroids. Definitely check out some of our recipes – we are expanding that category soon. My difficulty is finding an electric pressure cooker cookbook with a mac and cheese recipe. I would have thought this would be in every book but it is hard to find lol Can you help me out? Are there any Pressure Cooking books that contain information specific to small pressure cookers or the new pressure pans? I have a Fissler 6 qt. cooker and a 2 qt. pressure pan, but do not know how to use the pan. Thank you. Had the Chicken tonight and it was great. after reading the review I bought the Miss Vickie’s book of pressure cooking recipes. i wish you had mentioned that it has no photos – I would’t have bought it had I known. I think it would be a good idea to let people know so they can decide not to buy if it doesn’t suit them. .